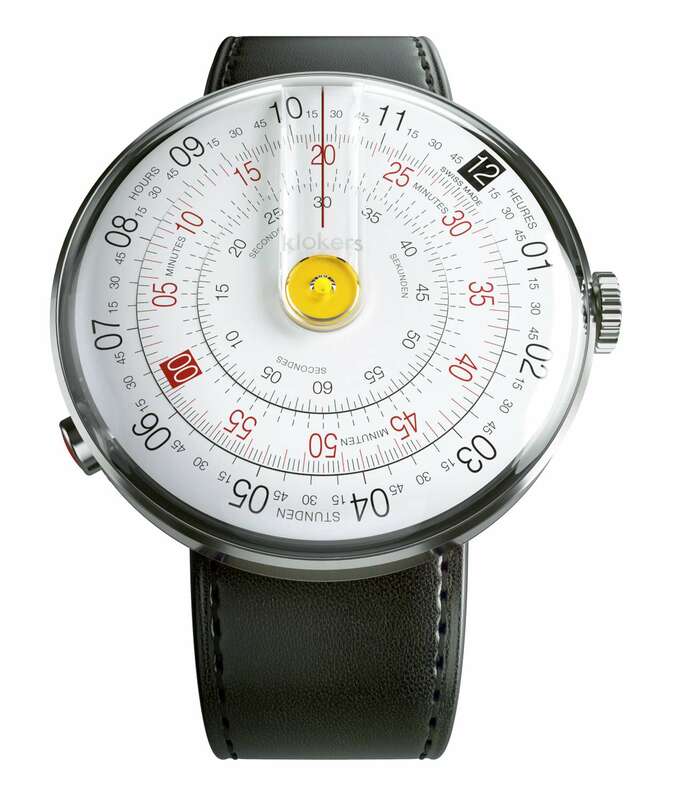 The new watch brand klokers makes its debut with a watch that looks like a slide rule. 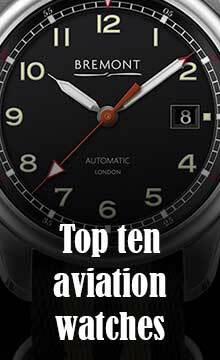 Powered by a quartz movement, instead of having hands it has three rotating discs (hours, minutes, seconds) read off against a red vertical line, with an integrated magnifying lens in the watchglass for greater clarity. A slide rule may trigger uncomfortable memories for people of my generation for whom it was the only calculation machine that could be used in maths lessons, before the early 1970s when they were supplanted by the first clunky and overpriced pocket calculators. 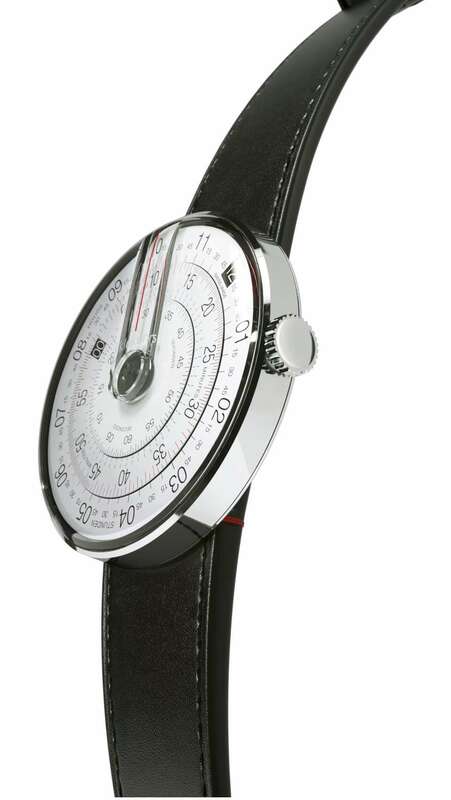 In a way, the disappearance of the slide rule was mirrored by the quartz revolution in watches, which put about two-thirds of Switzerland’s mechanical watch brands out of business. The watch, KLOK-01, is not cheap (considering the quartz movement) at $389, though it will be launched with a Kickstarter campaign in September 2015 with a numbered edition of 600 pieces at $199, 200 each in yellow, grey and indigo. KLOK-01 has a large 44 mm case, 17 mm thick, made in a composite metal polymer. It is water-resistant to 30 metres. A pusher on the caseband at 8 o’clock enables the watch to be released from the strap, making the strap interchangeable and also enabling it to be used as a bracelet (with its own reference KLOK-00). The bracelet collection that will be available in 2015 comprises the versions in matt black leather, silky black leather, indigo leather, orange alcantara, mouse-grey alcantara, and Newport yellow leather. Two new collections of bracelets will be launched every year. The movement is a Swiss-made Ronda quartz calibre that drives Lavet micro-rotors to activate the three discs, rotating counterclockwise. KLOK-01 is marketed online at www.klokers.com, where you can register for the Kickstarter campaign numbered edition launch watch at $199 (subject to availability). Thereafter the watch will be priced at $389. Update 15 September 2015: KLOK-01 reached their goal of €50,000 in 8 minutes on Kickstarter. Update 22 September 2015: two hours after its launched, Klokers reached 400% of the funding goal, over €200,000, paid by early backers who want to receive the KLOK-01 watch. The brand was founded by Nicolas Boutherin, president and artistic director, and Richard Piras, CEO. Nicolas has a background ranging from cartoons to luxury goods, working as art director and general manager in communications and media companies. Richard Piras has worked in the area of technology, in particular electric vehicles, aeronautics, and medical devices. KLOK-01 is their first watch.